I came across Gegege no Kitaro from a roundabout way. I had rented a film called Yokai Wars, and basically it’s Gegege but with no Kitaro. 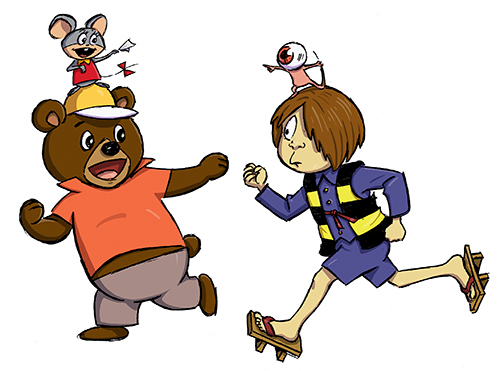 It’s all the side yokai characters, like the ones mentioned in previous posts, plus hundreds more. I’m guessing since all the yokai are based on actual legends, the film was sort of ripping off Kitaro on a loop hole. Oddly the creator of Kitaro (Shigeru Mizuki) makes a cameo at the end of the film; who knows what was going on, maybe it was all licensing issues? Honestly I can’t recommend the film, except for the wild yokai costumes, which are amazing. 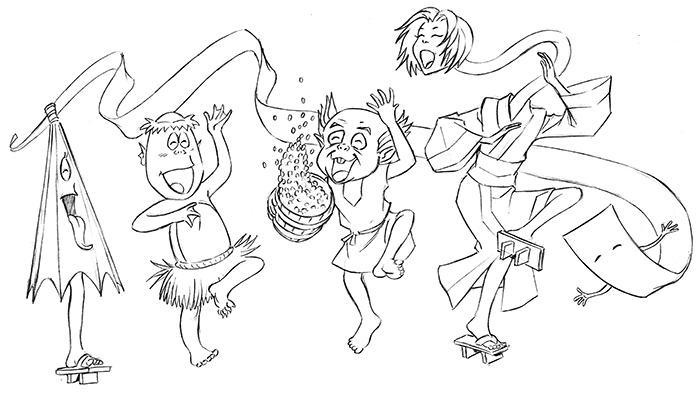 As I mentioned, the same yokai appear in Kitaro, and here’s a sketch with a few. Seeing all those wild yokai I did some internet searching about the movie, and that lead me to Gegege no Kitaro, and then a site where I found some fansubs of Kitaro, but they also had a cartoon called Hustle Punch. Hustle Punch is another late 60s Japanese anime, but it’s one (if not the only) cartoon I’ve seen from Japan focused only on cute animals. It has a strong Hanna Barbera feel, and I can’t prove it was influenced by Yogi and Top Cat, but it certainly has that flavor. It’s a bear (Hustle) who lives in a trash heap with a weasel (Bun), and a mouse (Touch), but they’re constantly harassed by gangsters. The main thug is a cat (Black- that looks a lot like Top Cat), who has an eye-patch wearing, side-kick pig (Nu), and they’re bossed around by a wolf (Prof. Garigari)~ then comedy ensues. It’s really cute, upbeat, and fun. I tried to find others, but the only place I’ve seen them is on a Russian version of YouTube, and considering what those Ruskies have been up to on the internet, I’ll steer clear of that for now. 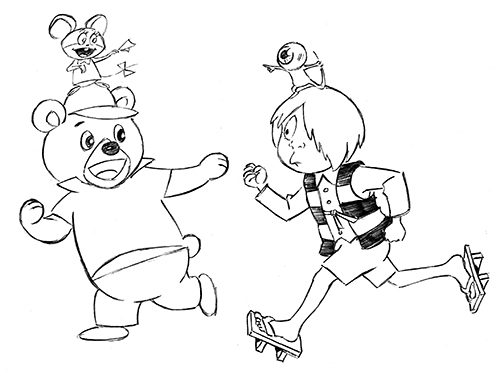 This was actually the very first Kitaro drawing I ever did.